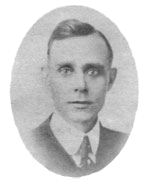 Horace Humphreys was born on February 7, 1879, in Athens, Tennessee. His family had come to America before the Revolution and were among the first pioneers in Sevier County. After attending public schools in McMinn County, he enrolled at Grant University and after graduation, took his first job with the railroad. In 1889, he came to Chattanooga to enter the wholesale grain business and was successfully pursuing a career there when he was elected to the county court. Humphreys married Alice Maddox in 1904, and they had four children. A prominent family in the area, they were very active in community affairs. Humphreys campaigned as a Republican candidate for sheriff in 1922 on the platform that “prohibition laws are capable of enforcement in Chattanooga and Hamilton County.” He promised that if elected, he would vigorously enforce the prohibition laws. Both newspapers printed extremely critical articles about Humphreys which questioned his honesty. However, he emerged victorious, elected by a landslide that gave him the largest number of votes ever given to a Hamilton County sheriff. No stranger to politics, Humphreys was an acknowledged leader of the GOP throughout his career. When his term of sheriff expired, he was appointed by President Herbert Hoover as a prohibition officer in this region. He later joined his wife in the management of their florist business until his death in 1945 at sixty-six years of age.